For years now, I’ve noticed these white critters on my shrubby dogwoods (Cornus) in August, and I always assumed that they were some sort of caterpillar. I never worried all that much about them, except for noticing that there seem to be more and more each year. 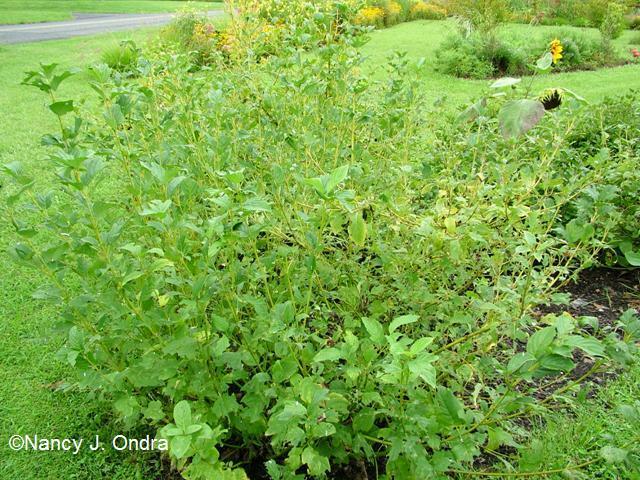 Even though they quickly demolish the leaves they’re feeding on, the plants don’t seem much weakened by the damage. The other day, I overheard a customer asking our retail manager about the same insects on her dogwoods, and I decided I should do a little research to find out what they are for sure, in case I got asked the same question. 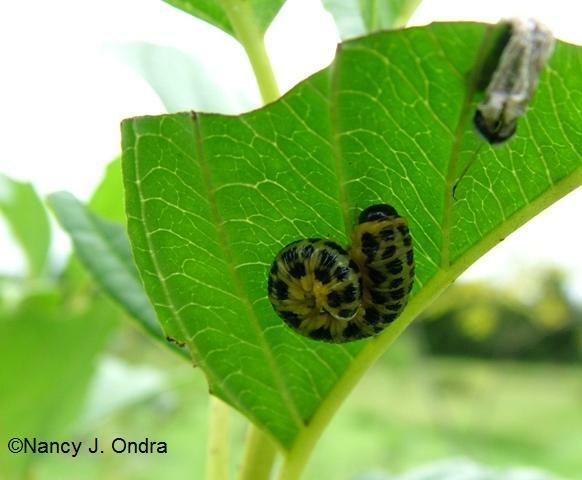 Turns out that they’re not caterpillars at all: they’re the larvae of the dogwood sawfly (Macremphytus tarsatus). And that means that Bt sprays wouldn’t work on them, if one were inclined to take control measures. So, I poked around a little more and found this Dogwood Sawfly Fact Sheet from Penn State, which suggests handpicking or else spraying with insecticidal soap or horticultural oil. They advise spraying in July, saying that the larvae stop feeding once they’re over 1 inch long. I think I’d better let those on my plants know, because it looks to me like they’re still very active and feeding quite heartily. Another reference mentioned that migrating birds will feed on them, so I’ll think I’ll take a hands-off approach for yet another year, even though the damage is getting pretty bad. Here’s a patch of ‘Bud’s Yellow’ red-twig dogwood. You can see that the sawfly larvae have already chowed down on the left side. There’s not a whole lot left when they’re done. 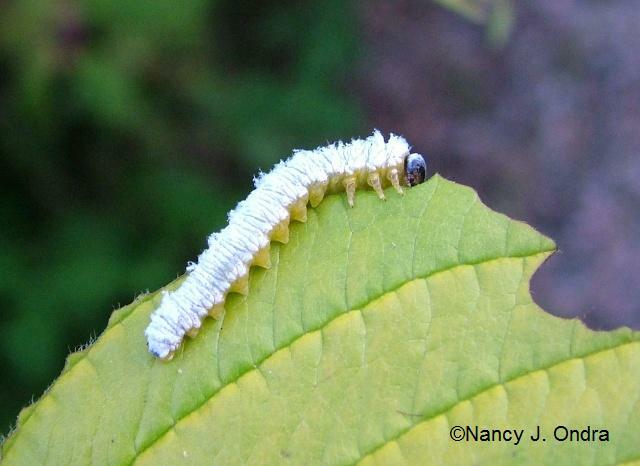 The first instar stage emerges in June and is a translucent yellow, easily blending into the leaves. I think the one in the center of the photo below might be one getting ready to molt. Those with the powdery white coating are the second instar. When they molt, they leave their old clothes strewn about. The yellowish ones with black spots are the third instar. Not sure which stage this all-black one is at, but it too is a dogwood sawfly larva. Okay, birdies: come and get ’em. Please! Yes, where are those hungry birds when you need them?? These are like naughty teens leaving their dirty clothes all over. tee hee… I haven’t noticed them in my garden, thankfully. Your comment prompted me to do a little more digging, Lisa, and I found that these are primarily a problem in the eastern U.S. 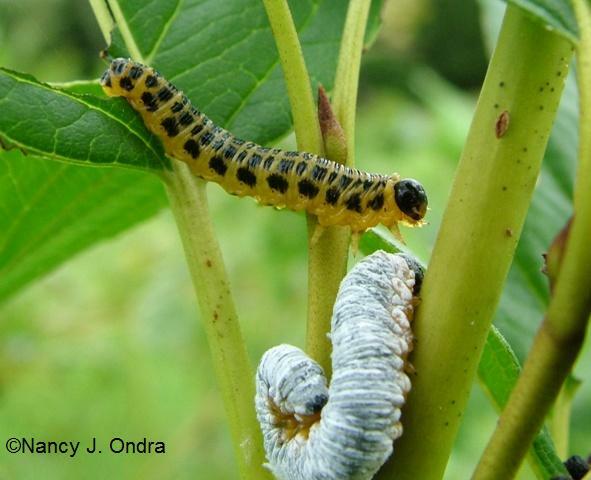 Anyone who wants to know about the range and habits of dogwood sawflies in excruciating detail can check out this study: Feeding Preferences of Dogwood Sawfly Larvae Indicate Resistance in Cornus. It’s actually pretty interesting. Eww! I’ll keep an eye out for these wee beasties, but I don’t think I have a problem with them yet. Thanks for raising the alert. I’ll be ready for them if they do show up. At least these critters are native, so we could think of them as being good, right – “bringing nature home” and all that? I guess. I just took care of some caterpillars in our redbud tree. I’m sure they weren’t the same thing but they sure did a number on it! I’ll keep an eye out for these caterpillars, I have plenty of red twig dogwoods they don’t need to munch on! I wonder if it’s fall webworms that you’re dealing with, Dave. I’ve noticed them starting to be active here in the last week or so. I had these in July and went online to figure it out! I had dozens on my red twig ‘cardinal’, picked them off and mushed them up. 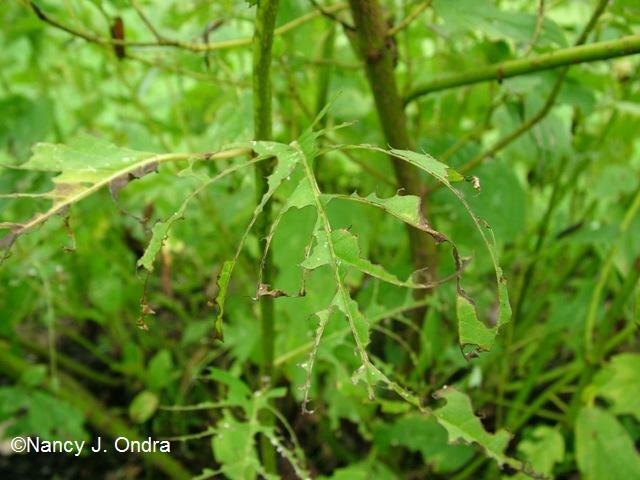 Die sawflies! (Then I accidently tossed a red spotted purple larva from the crabapple–I still feel terrible about that). Verrry interesting, Benjamin – so they’re *not* just an East Coast problem after all, if they’re bugging you out in Nebraska. Awww… your poor dogwoods! But I love the photos, Nan–you did a wonderful job of showing these guys in all of their stages. Thanks, Kim. I had plenty of subjects to work with, unfortunately! Messy little critters….leaving their clothes all over the place. And destructive, too. A very interesting and informative post along with fantastic photos. Yeah, I’d never noticed all the dead skins in previous years – though I really hadn’t looked as closely as I did when I was taking the photos yesterday. I hadn’t realized that there were other stages besides the white ones, either. Another benefit to blogging: you pay better attention to stuff like this! Nan .. you should post a warning before we see these pictures girl !! … I would think the birds would be flocking to feast on these critters .. so that is strange .. perhaps a “glut” of them are happening in the past couple of years and the birds can’t keep up with their population ? 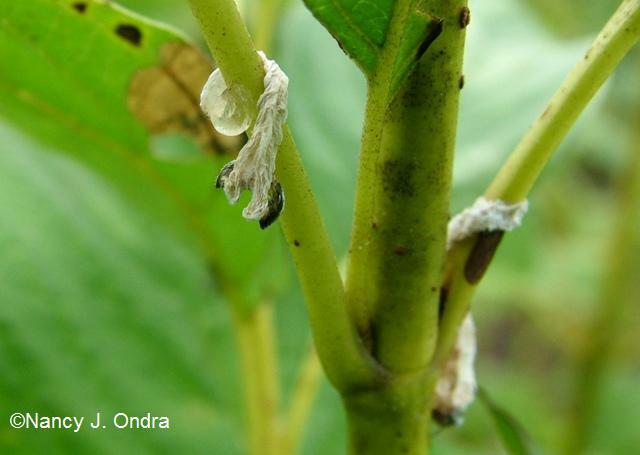 Lord .. these and aphids and earwigs … EEUUUWWWWW !! Yikes – sorry about that, Joy. I’ll try to remember to add WARNING: ICKY BUGS! at the top of future pest posts. 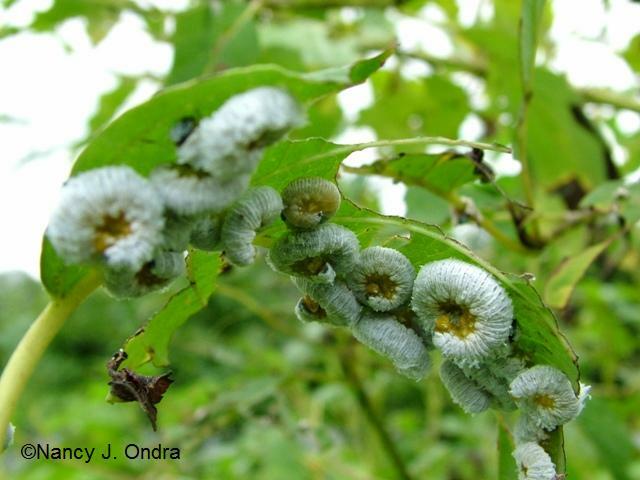 Fortunately, I very seldom write about stuff like creepy sawflies: plants are way more fun to talk about. Gosh Nan, these are scary! Tossing their clothes about, very poor upbringing, sounds like my daughter Semi! HA This is no laughing matter, I assume though. Does a large supply of this type of wormy thing mean the birds need more food? Or something along those lines? What is the significance in the time/space continuum? :-) Better check my yellow and red twig shrubs just in case. Don’t know if I can squish them like Benjamin, maybe move them to the compost pile? Ow, poor Semi, Frances! 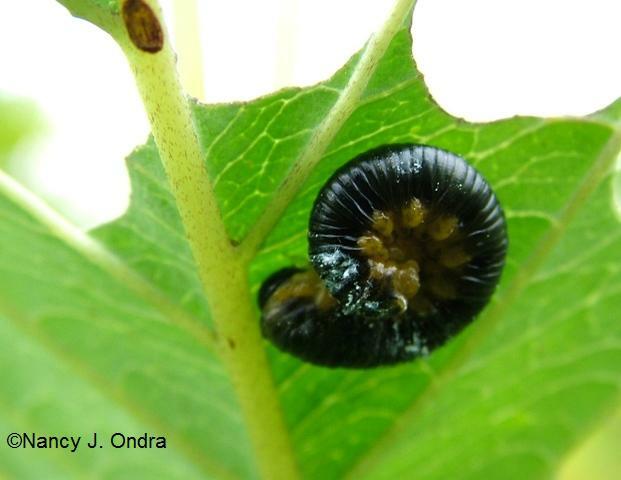 While I have sometimes attempted to apply principles of quantum physics to gardening (just ask my poor co-workers), I’m too brain-dead at the moment to try to figure out how dogwood sawflies fit into the whole thing. Though I suppose I could take comfort in the belief that, in some parallel universe, my dogwoods must have made it through an entire season *without* these creepy crawlers. Nancy- I have to tell you how much I am enjoying reading your latest book. It is perfect, all the information a gardener would need on a daily basis in one place. Thank you so much for your effort. I’m so sorry I missed your visit, Heidi. I’ll be in touch by e-mail. Yipes. I’ve never seen these before, Nancy. I hope your dogwoods are okay after all this! The plants seem to return all right each spring, I guess because most of the damage doesn’t happen until late summer. I figure it’s one of those deals with native insects feeding on native plants: if the pests caused too much damage, they’d eat themselves out of a food source over time. So I’ll stay out of it and hope I’m right. I have never seen these before, nor do I want to. I have a beautiful Cornus kousa that I planted as a “living memorial” for my mum. I guess I better rush out and check it! Thanks for the info. I hope you didn’t find any of these little buggers on your special tree, Deborah. Apparently kousas aren’t nearly as desirable to them as the shrubby kinds, for some reason. I have had these on my red twig dogwoods for years and wondered what they were, although I was too lazy to do the research, so thank you. I have had hundreds at a time, so hand picking is difficult. I have to admit that I have smashed many of them over the years and now I don’t feel so bad about it. I have never noticed any birds eating them, so I think I will continue with the smashing. Yeah, depending on the birds was a bust. Now that the plants are pretty much lace, the larvae are heading off to find overwintering spots. Apparently they like to hibernate in dead wood, which is kind of a problem, since I have a log house with plenty of joints and checks for them to crawl into. Eeew. Sorry to hear that they’re bugging you too, Debra. Since you only have one dogwood, maybe you can catch them early next June (check the undersides of the leaves) and pick them off before they do so much damage. I’m trying to remember whose blog I saw a photo of one of those on today. She thought that’s what they were, after looking them up. I am like you, and try to let nature take its course, except for when the slugs gang up on my plants. I’ll take them off and put them on the edge of a bird bath, and a few seasons, I’ve used one application of a pet safe product to reduce the population. I have had a number of kinds of caterpillars, some in large numbers, and was thankful to find out they will not kill the plants, so I have just taken their photos. This year, I planted more host plants, but haven’t seen many caterpillars. Hopefully, they are there, and are finding more hiding places. Maybe you were thinking of Jodi from Bloomingwriter’s post? She did get her critters ID’d (from coming here, as a matter of fact). I’ve never been much into spraying, but after reading Doug Tallamy’s book and hearing his lectures, I’m much more inclined to leave all caterpillars alone so they can play their part in the food chain.